Any reference to ‘EQ’, ‘we’, ‘us’ or ‘our’ means EQ Investors Limited. 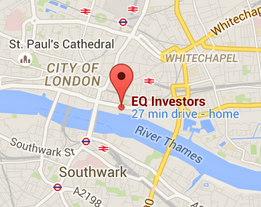 EQ Investors Limited is a registered company in England (No.7223330). Its registered office is at 6th Floor, 60 Gracechurch Street, London EC3V 0HR and its main place of business is 100 Lower Thames Street, London EC3R 6DL. EQ is a financial advisory and investment management firm which mainly acts for private clients, corporations and charities. We are authorised and regulated by the Financial Conduct Authority. EQ takes all reasonable steps to ensure that any information, data, services, systems, articles, bulletins and other content (‘content’) published from time to time on the site is accurate and complete and complies with relevant English legislation and regulations as at the date of issue. Whilst we take all reasonable steps to ensure that the information on the website is accurate and up to date, neither EQ nor its suppliers warrant that it is. You acknowledge and agree that neither EQ nor its suppliers have any control over the accuracy or completeness of third party data and all liability in respect of the same is expressly excluded to the maximum extent permitted by law. If you would like financial advice, you can ring 020 7488 7110 between 8:30am–5.00pm, Monday to Friday and one of our advisers will contact you at your convenience to discuss your requirements. The website does not constitute an offer to buy, sell or provide any financial products or services, nor does the website comprise any form of investment advertisement. We reserve the right to collect information about numbers of users of this site and individual pages for the purpose only of developing and customising this website to better meet our clients’ needs. We accept no responsibility for information outside our web pages that may be accessed by hypertext link from these pages or for these other sites not being available at all times. The links to any other sites are provided for general information purposes only and the sites concerned and their contents are not endorsed or promoted by us in any way, unless otherwise stated. Please note that when you click on any external site hypertext link, you will leave our site and access the external site at your own risk. We will accept no responsibility or liability in respect of the material on any such other website. You may not create a hyper text link to this website without the prior written approval of EQ. We reserve the right to change these terms and conditions at any time by posting changes on the website. It is your responsibility to review the terms and conditions regularly to ensure you are aware of the latest terms and conditions. Your use of this website after a change has been posted will be deemed to signify your acceptance of the modified terms and conditions. We recommend that you print off and retain for your records a copy of these terms and conditions from time to time. Please note that the internet is not a totally reliable communication medium and is subject to failure of software or hardware outside the control of EQ which may lead to delays in, or total failure of communication data, messages or other material. We therefore do not warrant that the functions or materials accessible from or contained in this website will be uninterrupted or error free, or that defects will be corrected. Copyright in the pages of this site, in the screens displaying the pages and in the information and material contained therein and their arrangement, is owned by EQ unless otherwise indicated. This website may not be reproduced or adapted in whole or in part without the prior consent of EQ, except for the purpose of accessing our services and for producing print outs for your own personal records. Any such copies must retain any copyright or other intellectual property notices contained in the original material. The trade marks, images, logos, trade names or similar on this website which identify EQ or third parties and their products and services are proprietary marks of EQ and/or the relevant third parties. No licence is granted to you in these terms and conditions to use any such marks. Please note that any software is downloaded at your own risk. We do not warrant the suitability of any such software which is downloaded and accept no liability for any problems with your computer that may arise as a result. If you are in any doubt as to the suitability of software to be downloaded for your computer, it is recommended that you obtain specialist advice before downloading. If you believe any information on this site is inaccurate or have any suggestions on how the content of this site could be improved please email us at enquiries@eqinvestors.co.uk or call us on 020 7488 7110.